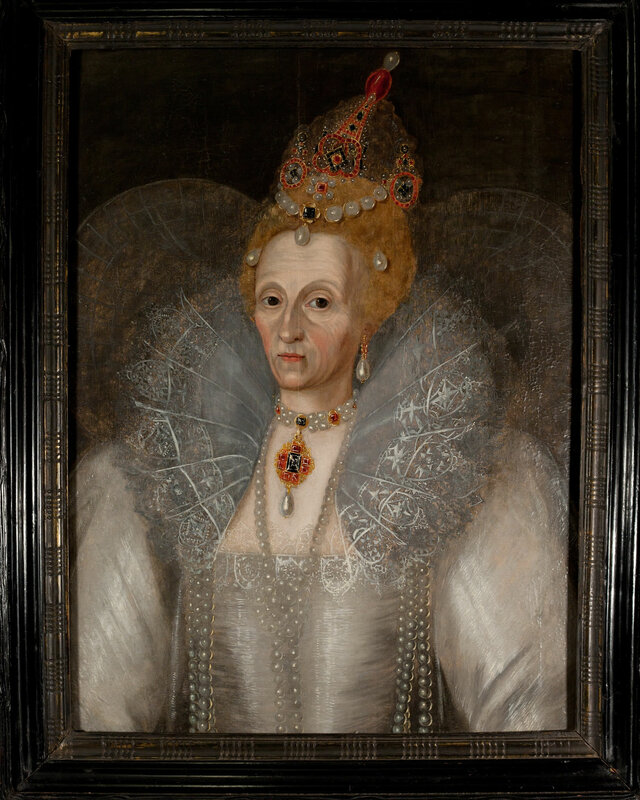 A painting of Queen Elizabeth I that portrays her in all her aging glory has recently been authenticated as in now on display at the Folger Shakespeare Library in Washington, D.C. This version of Elizabeth eschews the alabaster smooth skin and preternaturally youthful look that characterize her portraits long after the bloom of her youth had faded. She has deep wrinkles, bags under eyes, a greyish skin tone underneath the blobs of blush. She’s dignified and majestic in her posture and attire, but that wouldn’t have garnered the painter any favor with the queen. Realism was not her thing, and she started exerting control of her image from early in her reign. 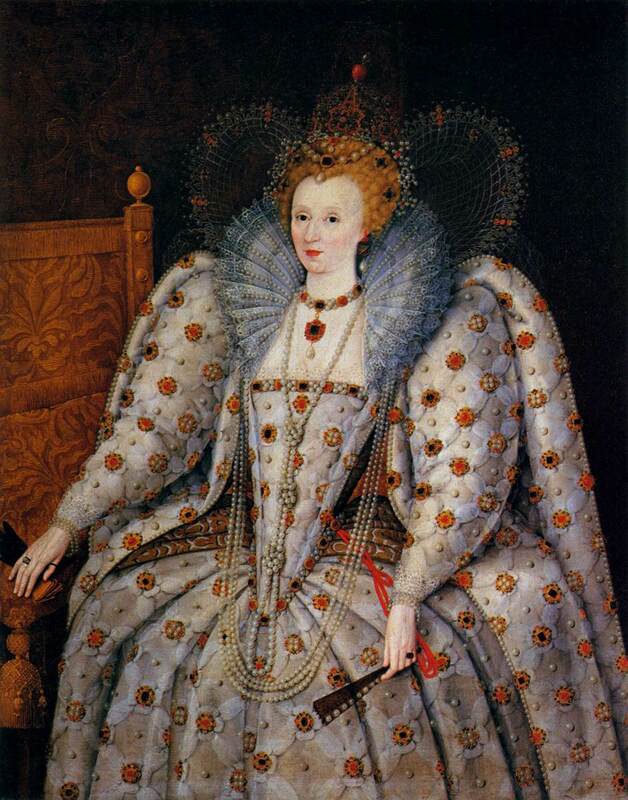 She was 30 years old and had been queen for just four years when she issued a Royal Proclamation in 1563 regulating the production of portraits. According to this proclamation, the Queen would approve one portrait of herself which would then be distributed to other painters to use as a template. That was fine when production was limited, but demand increased after Elizabeth’s excommunication in 1570 inspired a wave of patriotism. Displaying the portrait of Elizabeth was a way for everyone to declare support of queen and country. 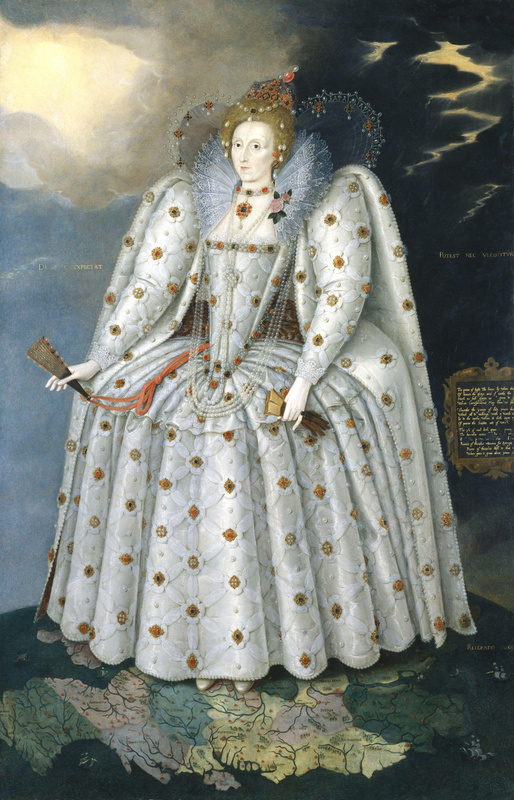 The next decade would see war with Spain and the defeat of the Spanish Armada which engendered even greater peaks of patriotic fervor and even greater demand for images of the queen. It became impossible for all the portraits in circulation to be pre-approved. In 1596, the Privy Council took action against this state of affairs, ordering officers “to aid the Queen’s Sergeant Painter in seeking out unseemly portraits which were to her ‘great offence’ and therefore to be defaced and no more portraits to be produced except as approved by [the] Sergeant Painter.” Many paintings of Elizabeth were seized and burned. 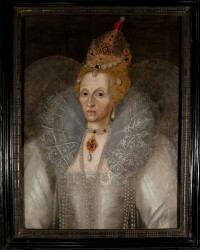 One of the portraits to survive the conflagration, the 1592 Ditchley Portrait by Marcus Gheeraerts the Younger, is one of the few surviving images of the queen which allows some small indications of her age. The newly revealed portrait has key elements in common with the Ditchley Portrait. The position and posture are the same, as are the hair jewels, necklace and lace collar. The faces are also similar, only one of them looks like she chose … poorly in that cave where the ancient crusader knight was guarding the Holy Grail. The oil on panel portrait was purchased by Ruth Coltrane Cannon, founding member of the Elizabethan Gardens on Roanoke Island, North Carolina, for $3,000 from a New York art dealer in the 1950s. If Mrs. Cannon or the dealer knew anything about its history, they left no evidence of it. She donated it to the Elizabeth Gardens, a botanical garden dedicated to the first British settlements in the New World founded by Sir Walter Raleigh during the reign of Queen Elizabeth I. When the Gardens opened on August 18, 1960, the portrait of Elizabeth was hanging on the Gatehouse wall where it greeted visitors for 50 years. The Gardens staff didn’t try to find out more about the painting until 2007. With growing scholarly interest in the portrait, in 2010 it was removed for conservation and then moved out of the Gatehouse permanently to a more secure, climate-controlled location. The materials in the paint and the wood panel and frame date it to the Elizabethan period. Experts now think it may have originated in the London studio of Marcus Gheeraerts the Younger in the mid 1590s, although who commissioned it and which hand painted it remain unknown. I wonder if it was a student piece. It doesn’t look complete to me. The lace on the collar, the relatively plain dress, that giant heart-shaped thing behind her are much sketchier in the Elizabeth Gardens portrait. The Ditchley Portrait was a popular model and several versions of it were made by the Gheeraerts studio. One iteration with an idealized younger face, simpler background and slightly different accessories was sent to Ferdinando I de’ Medici, Grand Duke of Tuscany, as an official diplomatic gift. It’s now in the Palazzo Pitti. Perhaps the Elizabeth Gardens version was a scrapped incomplete attempt which somehow got out into the world. With its age confirmed, the portrait has left North Caroline for the first time in more than 50 years and is stepping into the national spotlight. It will feature on an upcoming episode of Treasure Detectives, a new appraisal and authentication program debuting on CNBC Tuesday, March 5th, at 9:00 PM. You can see it live at the Folger’s Nobility and Newcomers in Renaissance Ireland exhibit which examines the relationship between England and Ireland in the age of Shakespeare. It runs through May 19th. This entry was posted on Sunday, March 3rd, 2013 at 11:25 PM	and is filed under Museums, Renaissance. You can follow any responses to this entry through the RSS 2.0 feed. You can skip to the end and leave a response. Pinging is currently not allowed. I re-watched Orlando ( http://en.wikipedia.org/wiki/Orlando_%28film%29 ) recently and here this is!